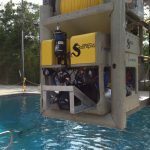 SeaTrepid’s Underwater Test and Training Facility provides opportunities to perform full scale testing of equipment and training of personnel. This 40 foot long, 30 foot wide, and 16 foot deep inground wet test pool. 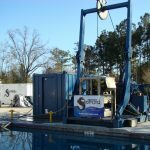 The pool bottom is embedded with 8,000 psi (55 MPa) concrete to support drill string, jacket structures, pipe and tooling for intervention testing, R&D, or diagnostics before fielding equipment. 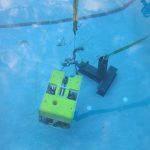 SeaTrepid International’s test pool is lined with high-test anchor points capiable of performing bollard pull testing of full WCROV systems. Each anchor point able to support 2,500 lbs (1,134 kgs). Surrounding the pool is 54,110 square-feet (5,027 square-meter) of sturdy 8,000 p.s.i. 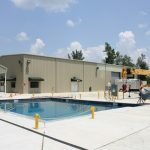 (55 MPa) concrete foundation, 1,200 amp 480 VAC 3 phase power, a 14‘ x 9’ (4.3 x 2.7 meter) climate controlled control cabana, a computer based learning center and a full ET shop to assist with diagnostics and training. 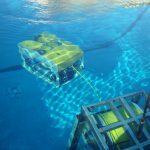 This facility was designed to allow for powering, testing, and heavy lifting of full work class ROV system and their hydraulic components as well as support their large Launch and Recovery Systems. 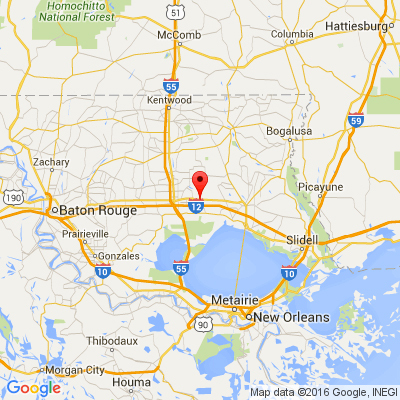 SeaTrepid International‘s purpose-built facility is located just North of Interstate 12, take Exit 47 (Hwy 445) to Hwy 190, in Robert, LA.